​We bought this business primarily out of our love for animals, as their well-being is so important to us. The pet supply business has grown in recent years, and we felt it would be nice for pet owners to have a store where they could get everything they needed to keep their pets happy and healthy in one convenient location. 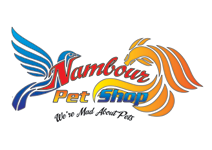 We want shopping at Nambour Pet Shop to be an experience the whole family can enjoy. Bring your pets to the store and we’ll give them the VIP treatment while you shop. Test out our products, grab a tasty treat for your pet, pick up some essentials and have fun​! We offer a wide range of products including Natural Products and all your fish needs! At Nambour Pet Shop we Supply Emu Logic products. Our emu oil has nothing added so you have the benefit of a pure product which has a multitude of uses and can be used safely for those with sensitivities to other products.Our soaps are made in Sydney to ensure the plain soap contains no contaminants for sensitive skin, the soap ingredients are natural plant extracts and emu oil.